England fans face the risk of “racist or homophobic intimidation, hooligan violence and anti-British hostility” at the World Cup, MPs have warned. A Foreign Affairs Committee report says non-match days and cities where England are not playing are major concerns, as is the welfare of BAME and LGBT fans. Up to 10,000 UK nationals are expected to travel to the World Cup. “Fans must know how to manage the risks so that they are safe,” said Tom Tugendhat MP, chair of the committee. “The safety and security of UK fans visiting the 2018 World Cup is the responsibility of the Russian government. Fans from BAME (Black, Asian, and minority ethnic) backgrounds and those who identify as LGBT (lesbian, gay, bisexual, and transgender) face additional risks of attack and persecution. The World Cup’s anti-discrimination chief Alexei Smertin has previously dismissed fears over racism and homophobia towards fans as “propaganda”. Earlier this year, Russian club Spartak Moscow were sanctioned after referring to its black players as “chocolates”, while Russian lawmakers have been criticised for a 2013 law targeting the promotion of homosexuality. 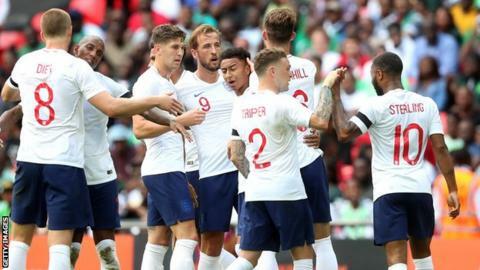 The Foreign Office will provide “additional consular support” on and around matchdays, including “mobile embassies” in cities where England are playing – but not elsewhere. “At this late stage, the [Foreign Office] should be able to demonstrate it can communicate swiftly with all the fans who travel,” Tugendhat added. “Vague reassurances from Foreign Office ministers have not been enough to reassure us that UK nationals will be safe, regardless of their background or sexual orientation. The Foreign Office said the safety and security of British fans remains the “top priority”. “We welcome the Committee’s report, including its recognition of the two years of preparatory work we and our partners, including the police, FA and Football Supporters’ Federation, have undertaken,” said a spokesperson. The World Cup gets under way on 14 June with England opening their campaign against Tunisia four days later.